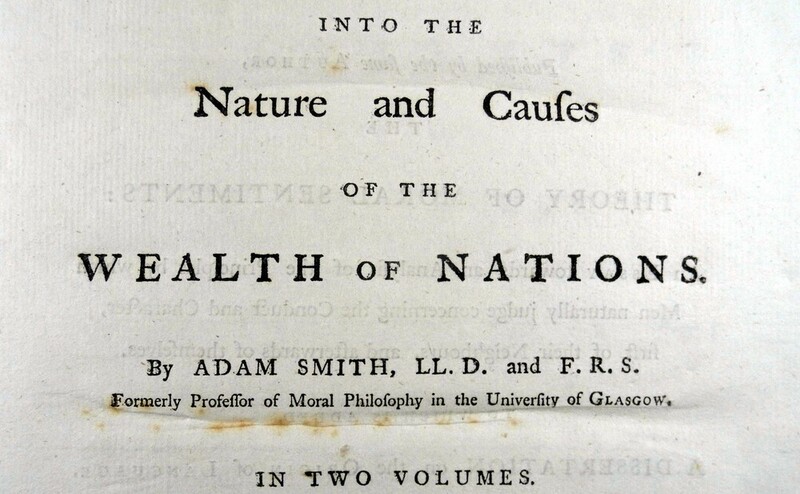 Today is the 239th anniversary of the publication of The Wealth of Nations by Adam Smith. For nearly a quarter of a millennium, we have actually known the principles by which wealth is created and maximised. The trouble is, that for a fair chunk of the same time, we have been trying to resist that information, thinking that we can somehow do better than the market. The Wealth of Nations is a great book: most objective commentators would probably put it among the top five books ever written, in terms of its influence on humankind and the way we live. Yes, it's very eighteenth-century stuff, sprawling and wordy, with enormous digressions on things that do not seem very interesting to us today. Luckily, you do not have to read it, because you can download my Condensed Wealth of Nations instead. And yet, Adam Smith's original is the book which took economics out of its primitive phase and made it distinctly modern. With a bit of time and effort, any of us can understand what Smith says because what he is describing is all around us today. The very first sentence of the book dismisses the old idea that the wealth of a nation was the amount of gold and silver that it had hoarded up in its vaults. Rather, says Smith, the measure of a country's wealth is what it produces. In that first sentence, he had invented the idea of gross domestic product. In the second, he notes the wealth of individual citizens of that country depends on how many citizens are sharing this GDP. (So there,he had invented the idea of GDP per capita.) In the third, he talks about how many people are actually working to produce this wealth. (The concepts of the participation rate, and productivity.) Before we are past the first page, we can see that this is sensational stuff. But surely his greatest breakthrough was the realisation that we do not have to conquer people or make things in order to increase our wealth. We can also increase it by simply exchanging things. If you have something I want and I have something you want, we are both better off by swapping it. And that is the foundation of market exchange and trade, and of the specialisation that makes our production and exchange system so spectacularly efficient, creating and spreading benefit throughout the world.